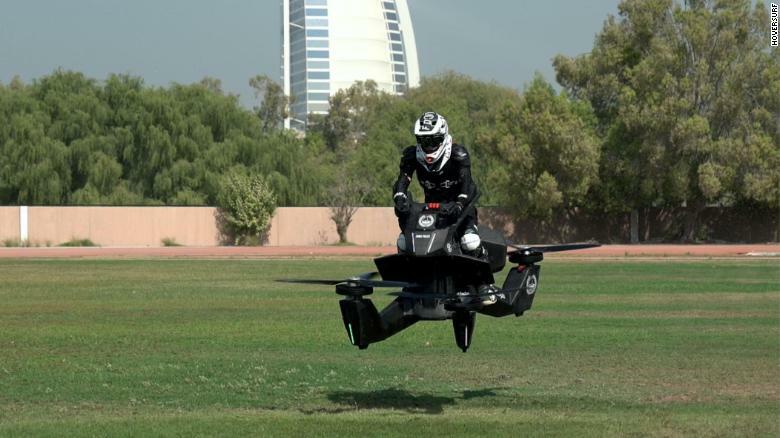 The flying motorbike is back in Dubai — and you could see the police riding one in the not-too-distant future. A year after California-based startup Hoversurf showcased its hoverbike at tech expo GITEX in the white and green livery of the Dubai Police, the company has returned with a new model and evidence its electric vertical take-off and landing (eVTOL) vehicle might be, well, taking off. Making good on a deal signed in 2017, Hoversurf has now gifted Dubai Police its first serial production unit of the S3 2019 Hoverbike and has begun training officers to fly it. If you’re not a member of the force and have a spare $150,000, the hoverbike could still be yours. Orders are open to civilians, but buyers are screened to ensure they can handle the new tech. In the US, the hoverbike has met Federal Aviation Administration guidelines which mean you do not need a pilot’s license to fly the vehicle. Both Hoversurf and Dubai Police said they were working towards this aim, either through battery technology or more efficient propulsion systems. Hoversurf has already developed a ducted fan system it claims is smaller, quieter, safer and more efficient than a propeller with the equivalent thrust, that it plans to add to future models. A manufacturing site for the S3 2019 is yet to be confirmed. The S3 2019 joins an ever-growing crowd of eVTOL aircraft in various stages of completion. Hoversurf also has a bigger, two-seater flying car it plans to showcase in “four to five months” and sell in 2020. Over 100 eVTOL or flying car projects have already been announced. He compared this period of frenzied activity and pioneering spirit to the early days of powered flight. Check out a video of a testing of the hoverboard below. They are noisy, slow, and dangerous. The exposed blades are nervewracking and could easily hurt someone if people are not being careful. I suppose that this technology needs to start somewhere.